The stamp bearing the image of King George VI value of 1 ¢. 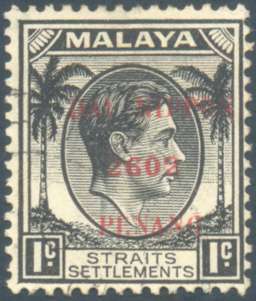 Stamp of Straits Settlements used between 1937-1941. 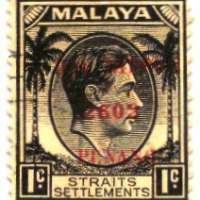 Postal services on Penang island resumed on 30 March 1942 using Straits Settlements stamps overprinted by Japanese seals of the Government Accountant, Mr. A. Okugawa, and his assistant, Mr. Itchiburi. 15 April 1942, Straits Settlement stamps overprinted with (DAI NIPPON / 2062 / PENANG) by Penang Premier Press. Die I - Printed in two operations. Lines of background touch outside of central oval. Foliage of palms touches outer frame line. Palm frond in front of King's eye has two points. Die II - Pinted from a single plate. Lines of background separated from central oval by a white line. Foliage of palms does not touch other frame line. Palm frond in front of King's eye has one point. Page 218, Straits Settlements, Volume 6, Scott Standard Postage Stamp Catalogue 2009.